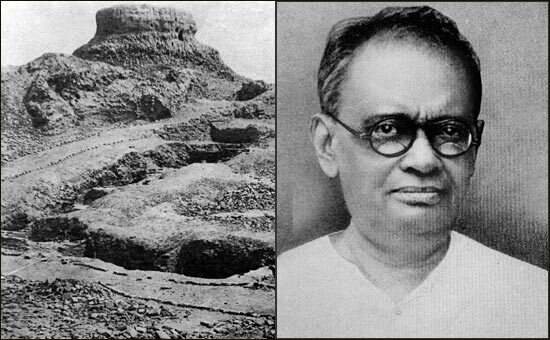 "One may begin with the earliest formulation of the collapse of India's first civilization–by Ramprasad Chanda. Chanda was one of John Marshall's Indian offices in the Archaeological Survey of India. The notion of a struggle between newcomers and earlier inhabitants is central to Chanda's view if the destruction of Indus cities at the hands of invading Aryans. Historical verification for such conquest came, for Chanda, from Rgvedic allusions to puras (cities and/or forts)–obviously those at Mohenjodaro and Harappa–and their destruction by Aryans, while the panis (merchants) of the Rgveda who did not follow Vedic practices were, he argued, Indus city-dwellers." "What seems to be practically unknown is that Chanda, the originator of the idea of Aryan annihilation of Harappans, substantially abandoned his original hypothesis within a few years. By 1929 Chanda did not consider the Aryan immigration as having swept away the chalcolithic civilization of the Indus Valley. His subsequent writing (I.3) demonstrates that they had now become a powerful minority among the native populations, the priests of the chalcolithic civilization. The Aryans remained a historical people from north-west Asia in Chanda's writings. It is just that, by 1929, he came to believe that his own idea of them as armed marauders was no more than a myth. He no longer believed that one type of culture was destroyed and replaced by another. Instead, he visualized a symbiotic relationship between immigrants and 'aboriginal townsfolk' which, he said, resulted in the birth of a 'mixed Hindu Civilization'. "Interestingly, unlike his earlier theory, this one did not, at this point in time, find many takers. The possibility of a small-scale Aryan migration while the Harappan civilization was flourishing has, however, recently resurfaced in various forms and is an important theme in many writings on the Aryan question. Indus specialists seem to have forgotten Chanda's later work. Therefore most readers are perhaps unaware that the image of an Aryan presence during the lifetime of Harappan cities is present even in the work of the very scholar who first put forward the hypothesis of an invasion by martial Aryan hordes singing hymns in honour of Indra or Purandara, the 'sacker of cities'. While its various ramifications have been more recently fleshed out, clearly the idea itself dates back to that exciting decade when the archaeological splendour of Mohenjodaro and Harappa was being excavated and understood." Nayanjot Lahiri in The Decline and Fall of the Indus Civilization, pp. 6-8.